ORIENTATION: Job characteristics play a major role in shaping employees' early retirement decisions. RESEARCH PURPOSE: The objective of this study was to examine the mechanisms through which job characteristics associate with early retirement intention, using the Job Demands-Resources (JD-R) model as a theoretical framework. MOTIVATION OF THE STUDY: Early retirement presents a threat to existing health and pension systems, and to organisational functioning. Therefore, it is important to examine how work-related factors contribute to early retirement decisions. RESEARCH DESIGN, APPROACH AND METHOD: Two parallel processes were theorised to shape early retirement intention: a health impairment process (i.e. job demands recovery need early retirement intention) and a motivational process (i.e. job resources work enjoyment early retirement intention). Survey data were collected from a heterogeneous sample of 1812 older workers (age > 45). Structural equation modeling was used to test the hypotheses. MAIN FINDINGS: Job demands and job resources were both associated with work enjoyment, which was associated with early retirement intention. Recovery need did not add to the prediction of early retirement intention. PRACTICAL/MANAGERIAL IMPLICATIONS: To retain older workers, companies should promote work conditions and practices that keep older workers motivated. Good health may be a necessary condition for retaining older workers, but it does not appear to be a sufficient one. CONTRIBUTION/VALUE-ADD: The results suggest that - for early retirement intention - the motivational process is more prominent than the health impairment process. In most developed countries (e.g. UK, the Netherlands, New Zealand, Canada), the official age of retirement is 65. However, the actual retirement age is well below this age (Organization for Economic Cooperation and Development [OECD], 2009). This has led to a growing contingent of early pensioners, which presents a threat not only to existing health and pension systems, but also to organisational functioning: early retirement may result in loss of valuable, organisation-specific knowledge that is costly and time-consuming to replace (Beehr, Glazer, Nielson, Farmer, 2000). These problems have inspired a substantive amount of research concerning the factors associated with employees' intentions and, ultimately, their decision to retire early (e.g. Beehr et al., 2000; Higgs, Mein, Ferrie, Hyde, & Nazroo, 2003). Most research in this respect has concerned individual difference factors, including demographics, self-rated health, financial status and attitudes toward retirement. In contrast, fewer studies have concerned associations between work-related factors and early retirement intentions, which is conspicuous given the abundant evidence that the work situation accounts for much variation in withdrawal from work (Bakker, Demerouti, De Boer, & Schaufeli, 2003; Bakker, Demerouti, & Schaufeli, 2003). Moreover, research examining the psychological processes through which these work-related factors associate with early retirement intentions is virtually nonexistent. To address this gap in the literature, researchers have recently called for studies examining the mechanisms underlying age-related phenomena, such as early retirement intentions (Cadiz, Truxillo, & Sinclair, 2009). Thus, the present study's aim is to respond to this call by examining whether and how work-related factors associate with early retirement. We focus on voluntary, rather than involuntary (e.g. due to employment constraints), early retirement because of its undesirable consequences for organisations and society. Using the job demands-resources (JD-R) model (Bakker & Demerouti, 2007; Demerouti, Bakker, Nachreiner, & Schaufeli, 2001), we tested the hypotheses that job demands (i.e. workload and problems with change at work) relate positively to early retirement intentions via a process of health impairment (i.e. recovery need) and that job resources (i.e. job control and social support) relate negatively to early retirement intentions via a motivational process (i.e. work enjoyment). Figure 1 presents our research model. These hypotheses were tested in a sample of 1812 Belgian workers aged 45 years and older. The situation in Belgium for the period 2002-2007 is that men retire, on average, at the age of 59.6 and women at 58.3 (OECD, 2009); hence, Belgium presents an exemplary case to study issues related to early retirement. One of the key questions in retirement research is why people retire and why they retire early. Feldman (1994) defines retirement as 'the exit from an organizational position or career path of considerable duration, taken by individuals after middle age, and taken with the intention of reduced psychological commitment to work thereafter' (p. 287). According to this conceptualisation, retirement is the product of an informed decision-making process that unfolds over time, in which workers evaluate the overall utility of retirement before they reach the decision about whether to retire (Wang & Shultz, 2010). Most of the research on retirement has focused on 'retirement as decision-making' and several theoretical frameworks have been used in association with this conceptualisation, including rational choice theory (Gustman & Steinmeier, 1986), image theory (Beach & Frederickson, 1989), role theory (Ashforth, 2001), theory of planned behaviour (Ajzen, 1991) and expectancy-value theory (Vroom, 1964). Similarly, in this study we take a decision making approach to early retirement. Early retirement then refers to the withdrawal from the labour force before the country's official retirement age, or the age at which the individual is entitled to a full old-age pension (Schils, 2008). Early retirement intention refers to the worker's perception concerning the desired or intended time span before retirement. Several authors (Beehr & Bennett, 2007; Wang & Shultz, 2010) note that early retirement intention is possibly one of the best predictors of actual retirement age. We focus upon early retirement intention, rather than age at the time of retirement: our basic argument is that we aim to hint at possible ways to prevent undesirable early retirement. The implication is that we target workers who deliberately choose or plan to retire early and not workers who are forced to retire early owing to, for example, organisational restructuring. Unlike age at time of retirement, early retirement intention captures this distinction. Microlevel personal factors: Not surprisingly, research consistently shows that the likelihood of retirement rises with age (e.g. Wang, Zhan, Liu, & Shultz, 2008). Education is also related to retirement decisions, with highly educated employees being less likely to retire early (e.g. von Bonsdorff, Shultz, Leskinen, & Tansky, 2009). Impaired health is another major factor influencing retirement decisions (e.g. Karpansalo, Manninen, Kauhanen, Lakka, & Salonen, 2004). Health problems may cause employees to reconsider priorities, which to many means spending more time with family and friends, even if they could still perform at their jobs (Kim & Feldman, 2000). Finally, several studies have shown that financial status and in particular financial distress, is an important driving force for people to continue working (e.g. Gruber & Wise, 1999). Mesolevel work-related factors: Research into the available literature shows that retirement decisions have been positively associated with a variety of work-related factors, including technological, managerial and cultural changes in the workplace, workload and physical demands. Conversely, retirement has been negatively associated with factors such as skill discretion, autonomy, opportunities for development, task clarity, job complexity, positive work climate and supervisory fairness (e.g. Sutinen, Kivimäki, Elovainio, & Forma, 2005). The present study aims to extend this mesolevel perspective on retirement. Macrolevel environmental factors: A number of macrolevel environmental factors have been found to influence retirement decisions. For instance, organisations can affect retirement decisions by their pension plans and other retirement policies (Beehr & Bennet, 2007). Also, employees are more likely to retire when their organisation is facing financial hardship or downsizing (Hardy & Hazelrigg, 1999). Furthermore, retirement decisions may be influenced by cultural norms about when to retire (Beehr & Adams, 2003) and by negative stereotypes with regard to older workers (Posthuma & Campion, 2009). In the present study, we focus on the role of work-related factors in the early retirement decision-making process. We do so for two distinct reasons. Firstly, many of the frequently studied predictors of early retirement are tied to the individual and are fairly stable. Hence, they are difficult for organisations to manage or change. For instance, knowing that employees' decisions on when to retire are affected by their spouse's work status does not help organisations in any way to retain older workers. In contrast, our focus is upon aspects that are to a significant extent under the control of the organisation and that are, compared to individual factors, easier to change and to remedy. Conditional for such change and remedy are organisational prevention-based strategies, for example, job redesign to reduce work demands or participative decision making and skill training to increase job resources (see e.g. Couser, 2008). Whilst there are few studies about organisational interventions, the general belief is that such practices are beneficial to employees' well-being (Kompier, Geurts, Grundemann, Vink, & Smulders, 1998). Accordingly, work-related factors in the form of job demands and job resources are, from a management perspective, more interesting to focus on. Secondly, despite the progress made, work-related factors have received considerably less research attention compared to other factors (Beehr et al., 2000). In addition, most of the research on work-related predictors of retirement decisions has been conducted in a piecemeal fashion, without any cohesive theoretical framework. That is, few studies have started from a strong theoretical basis or testable hypotheses and they failed to explain the relationship between work-related factors and early retirement intention. A noteworthy exception is the study by Elovainio et al. (2005), who used the well-known Job Demand-Control (JDC) model (Karasek, 1979) to predict early retirement intention. The authors found that workers' early retirement intention was positively associated with job demands and negatively with control in the workplace and that job control mitigated the effect of job demands on early retirement intention. 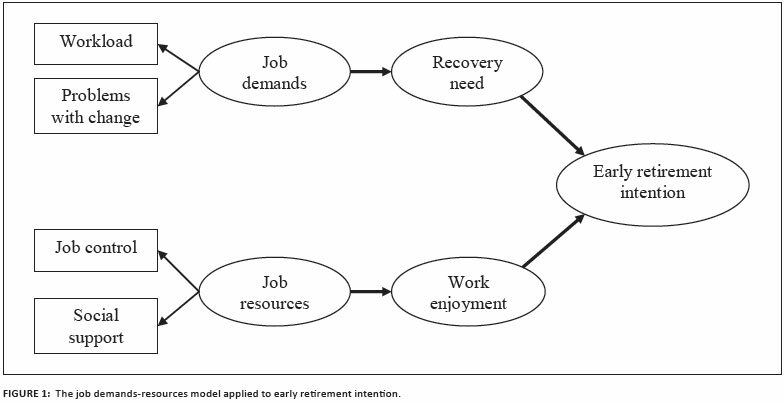 Before discussing both processes and how they might be associated with early retirement, we first describe the main components of the JD-R model (see Bakker & Demerouti, 2007, for an extensive narrative). Job demands refer to those physical, psychological, social or organisational aspects of the job that require sustained physical or psychological (cognitive and emotional) effort or skills and are therefore associated with certain physiological or psychological costs. Examples are high work pressure, an unfavorable physical environment, emotionally demanding interactions with clients (Bakker, Demerouti, Taris, Schaufeli, & Schreurs, 2003) and issues related to job insecurity and change (Bakker, Demerouti, & Schaufeli, 2003). Of particular relevance to this study are workload and change-related problems. Change-related problems refer to problems experienced with changes at the task level (e.g. 'do you find it difficult to adjust to changes in your tasks? ', see van Veldhoven & Meijman, 1994). The basis for this selection is twofold: firstly, it is grounded in the stereotyped idea that older workers are more resistant to change and less capable of adapting to an increasing workload (Posthuma & Campion, 2009). Secondly, it builds on empirical data showing that workload and change-related problems contribute to the worker's decision to retire early (Luce, van Zwanenberg, Firth-Cozens, & Tinwell, 2002).  stimulate personal growth, learning and development.  the task (e.g. skill variety, task identity, task significance, autonomy or performance feedback). We selected job control and social support for three reasons. Firstly, job control and social support are core to most job characteristics models in work and organisational psychology, including, for example, Karasek's (1979) Job Demand-Control model. Secondly, the relationship between job control and social support and a host of outcomes in the domain of work stress and motivation has been demonstrated abundantly (e.g. Thoits, 1995). Thirdly, the assumption is that job control and social support contribute to early retirement decisions, which has been demonstrated in some studies (Elovainio et al., 2005). The health impairment process can be summarised as follows: high job demands impose a great deal of strain on employees which may lead to energy depletion and short term fatigue, and in the long run, to serious health problems (Caplan, Cobb, French, Harrison, & Pinneau, 1975). The relationship between job demands and various indicators of strain has been demonstrated abundantly (e.g. Caplan et al., 1975; Demerouti et al., 2001). We see need for recovery as yet another and fairly new indicator of strain in the JD-R model (Sonnentag & Zijlstra, 2006). Recovery need relates to the individuals' experienced sense of urgency to take a break from a demanding work environment in order to replenish their resources (Sonnentag & Zijlstra, 2006). Accordingly, several studies have shown that individuals who have been exposed to highly demanding work situations experience a higher need for recovery than individuals who have not been exposed to these situations (e.g. De Croon, Sluiter, Blonk, Broersen, & Frings-Dresen, 2004; Sonnentag & Zijlstra, 2006). Hence, we expect job demands to be positively associated with recovery need.  Hypothesis 1: The relationship between job demands and early retirement intention is mediated by recovery need. According to the JD-R model, job resources have motivational potential that leads to positive outcomes. Several studies in the realm of the JD-R model have shown that job resources associate positively with motivation-related concepts such as job satisfaction, work engagement and work-related flow (e.g. Bakker, 2008; Bakker, Hakanen, Demerouti, & Xanthopoulou, 2007). In this study, we use work enjoyment as an indicator of motivation. In line with Spence and Robbins' (1992) original use of the term, we define work enjoyment as the extent to which people experience their work as pleasant and gratifying. As such, the concept of work enjoyment aligns and overlaps with similar concepts, such as job satisfaction (Spector, 1997) and work engagement (Bakker, Schaufeli, Leiter, & Taris, 2008). We expect job resources to be positively associated with work enjoyment.  Hypothesis 2: The relationship between job resources and early retirement intention is mediated by work enjoyment. A stratified sample of 5182 workers older than 45 was drawn from a large online panel (N > 100 000) representative of the Belgian active working population with regard to age, branch, occupational position and region. Representativeness was guaranteed through the use of various techniques (e.g. diversification of the recruitment methods, comparing the online panel with regard to the population, the method of proportionally interlaced layered sample survey taking and the introduction of various control mechanisms). The threshold of 45 years was chosen in accordance with previous studies on early retirement intention in which an equivalent (or even younger) cut-off age was chosen (e.g. Elovainio et al., 2005). Panel members (N = 5182) received an email in which the purpose of the project was described, and in which they were requested to participate. Confidentiality and anonymity of their answers were emphasised and assured. For those who wished to participate, a link to an electronic questionnaire was included in the email; 1812 respondents completed and returned the questionnaire. Taking into account that 10% of the email addresses bounced back, the overall response rate was 38.8%. This response rate was satisfactory (Baruch & Holtom, 2008). Of the respondents, 38% were female. The respondents' mean age was 48 years (SD = 3.6) and their mean organisational tenure was 18 years (SD = 9.9). Furthermore, 82% of the respondents had a full-time job. Almost 90% had a permanent job, whilst 3% had a temporary job and about 7% were involved in another type of contract. In addition, 70% of the respondents had a daytime contract, 13% worked in shifts, 11% had irregular working hours and approximately 2% worked during nights. The remainder of the respondents had other types of working schedules. About two-thirds worked in services, health sector or in public services. Approximately 23% worked in the industry or the construction sector, and 1% worked in the primary sector. Accordingly, the large majority of the respondents were white-collar workers (N = 1446; 80%). In terms of job resources, two job resources were included in the questionnaire, namely job control and social support. Both job resources were measured with scales taken from the Short Inventory to Monitor Psychosocial Hazards (SIMPH; Notelaers, De Witte, Van Veldhoven, & Vermunt, 2007). The SIMPH is a recently developed and validated short version of the VBBA (Dutch Questionnaire on Experience and Evaluation of Work, Van Veldhoven & Meijman, 1994). Job control was measured with a 3-item scale. Respondents had to rate the extent to which they were able to influence decisions about their job; an example item is 'I can decide myself how I perform my work'. Items were scored on a 4-point Likert scale, ranging from 1 ('never') to 4 ('always'). Reliability (Cronbach's alpha) was 0.85. Social support was measured with four items. Respondents had to rate the level of support they received from their colleagues and superior; an example item is 'If necessary, I can ask my colleagues for help'. Items were scored on a 4-point Likert scale which ranged from 1 ('never') to 4 ('always'). Reliability (Cronbach's alpha) was 0.78. In terms of job demands, two job demands were included in the questionnaire, namely workload and problems with change at work. Workload was measured with three items from the SIMPH (Notelaers et al., 2007), referring to quantitative, demanding aspects of the job; an example item includes 'I have to work extra hard in order to complete a task'. Items were scored on a 4-point scale that ranged from 1 ('never') to 4 ('always'). Reliability (Cronbach's alpha) was 0.83. Problems with change at work were assessed with a 3-item scale based on Van Veldhoven and Meijman (1994). Respondents had to rate the extent to which they were having difficulties with work-related changes; an example item includes 'Changes in my tasks pose difficulties to me' (1 = never, 4 = always). Reliability (Cronbach's alpha) was 0.81. Work enjoyment was measured with a 5-item scale taken from the SIMPH (Notelaers et al., 2007). The items tap the extent to which respondents find pleasure in working; an example item includes 'I really enjoy my work'. Items were rated with a dichotomous answering category (no = 0; yes = 1). The items were summed to form an index ranging from 0 to 5, with high scores reflecting more work enjoyment. For a scale composed of dichotomous items, the most appropriate index of internal consistency is the Kuder-Richardson formula 20 (KR-20, Nunnally & Bernstein, 1994). In the present sample, this equivalent to Cronbach's alpha was 0.85. Recovery need was measured by means of three items taken from the SIMPH (Notelaers et al., 2007) about the severity and duration of symptoms which indicate that the respondent is not fully recovered from the effects of sustained effort during the working day; an example item includes 'Generally, I need more than an hour before I feel completely recuperated after work'. Items were rated with a dichotomous answering category (no = 0; yes = 1). The items were summed to form an index ranging from 0 to 3, with high scores reflecting more recovery need. Reliability (KR-20) was 0.74. Early retirement intention was measured with four items similar to those used by Van Dam, Van der Vorst and Van der Heijden (2009) and were scored on a 5-point Likert scale which ranged from 1 ('strongly disagree') to 5 ('strongly agree'); an example item includes 'I intent to quit working before I am 65'. Reliability (Cronbach's alpha) was 0.90. Structural equation modeling (SEM) applying the maximum-likelihood method in LISREL 8.54 (Jöreskog & Sörbom, 2002) was used to test the hypotheses. We first evaluated the measurement model using confirmatory factor analysis (CFA). We then continued with the structural models, as follows: Model 1 was the hypothesised model. It included paths from job demands to recovery need, from job resources to work enjoyment and from both recovery need and work enjoyment to early retirement intention. Model 2 accounted for possible relationships between job demands and work enjoyment and between job resources and recovery need. Although strictly speaking not hypothesised, some studies have provided evidence for such cross-links between job demands and motivational outcomes (e.g. Hakanen, Bakker, & Demerouti, 2005), and between job resources and strain (e.g. Schaufeli & Bakker, 2004). Model 3 accounted for possible direct relationships between job demands and resources and early retirement intention. Thus, Models 2 and 3 included two additional paths each. A potential criticism could be that age is a critical factor affecting the relationships in the structural model. For example, job demands may be more important amongst older workers, for whom early retirement is a realistic option. We therefore inspected whether the best fitting overall model was invariant across age groups through multiple group analysis. In all analyses, job demands and job resources were allowed to correlate. Model fit was evaluated using several goodness-of-fit indices: the Root Means Square Error of Approximation (RSMEA), the Comparative Fit Index (CFI), the Standardized Root Means Square Residuals (SRMR) and the Non-Normed Fit Index (NNFI). RMSEA below 0.05 in combination with SRMR values below 0.09 indicate excellent fit, whereas values below 0.08 and 0.10 respectively indicate good fit (Hu & Bentler, 1999). CFI and NNFI values larger than 0.90 indicate good fit, whereas values larger than 0.95 indicate excellent fit (Bentler, 1990). The chi-square difference test was used to compare nested models. To test for the divergent validity of the latent factors, we estimated a full measurement model comprising the independent variables (i.e. job demands and job resources), the mediating variables (i.e. recovery need and work enjoyment) and the dependent variable (i.e. early retirement intention). Job demands and job resources were represented by their respective job characteristics. The latent constructs of recovery need and work enjoyment were indexed by three and five items respectively. Finally, the latent construct of early retirement intention was indicated by its four items. Estimation of the measurement model with 16 observed variables and five latent variables yielded good fit of the model to the data, χ2(94) = 501.26, p < .001; RMSEA = 0.05; SRMR = 0.04; CFI = 0.98 and NNFI = 0.97. All observed variables had significant (p < 0.001) loadings (ranging from 0.49 to 0.86) on their latent factor (mean χ = 0.72). A reliable measurement model was thus obtained. Next, the hypothesised JD-R model (M1) was tested. This model related job demands and job resources to recovery need and work enjoyment, respectively, which in turn were associated with early retirement intention. As is shown in Table 2, M1 showed good to excellent fit to the data. The path-coefficients from job demands to recovery need (γ = 0.77, p < 0.001), and from recovery need to early retirement intention (γ = 0.18, p < 0.001) were positive and significant, indicating that the higher the job demands reported by the employees, the higher their need for recovery, and the stronger their intention to retire early (cf. Hypothesis 1). In addition, the path-coefficient from job resources to work enjoyment was positive and significant (γ = 0.60, p < 0.001), whereas the coefficient of the path from work enjoyment to early retirement intention was negative and significant (γ = -0.32, p < 0.001). This means that more job resources coincided with more work enjoyment, which in turn was associated with a decreased intention to retire early (cf. Hypothesis 2). 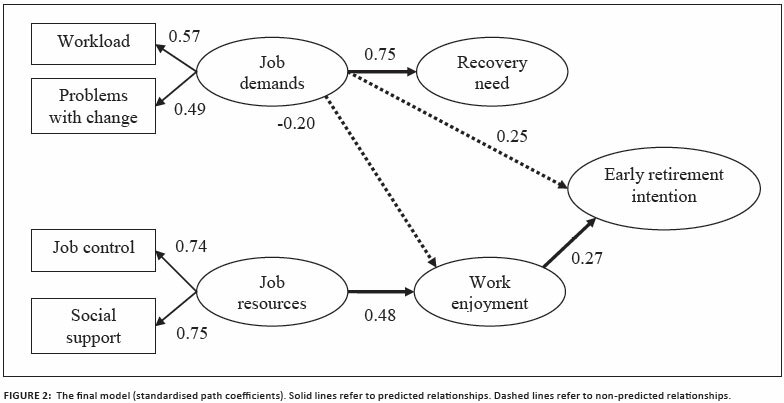 In order to test the alternative hypothesis that job demands are also related to work enjoyment, and job resources to recovery need, we included both diagonal paths in the model (cross-link model - M2). Compared to the previous model, adding both paths resulted in a significant improvement of the model fit, Δχ2(2) = 29.87, p < 0.001. However, only job demands showed a significant and negative relationship with work enjoyment (γ = -0.19, p < 0.001). Importantly, the model in which the paths from job demands to recovery need and to work enjoyment were constrained to be equal was significantly worse than M2, Δχ2(1) = 258.02, p < 0.001. The second alternative model included additional direct relationships between job demands and early retirement intention and between job resources and early retirement intention (partial mediation model - M3). Compared to M1, adding both direct paths resulted in a significant improvement of the model fit, Δχ2(2) = 19.61, p < 0.001. The direct path from job demands to early retirement intention was positive and significant (γ = 0.32, p < 0.001), indicating a direct relationship. Including this path resulted in a non-significant association between recovery need and early retirement intention (γ = -0.08). Hence, recovery need does not seem to carry the relationship between job demands and early retirement intention. Conversely, the direct path from job resources to early retirement intention was non-significant (γ = -0.03), suggesting full mediation by work enjoyment. The results of a Sobel test confirmed that job resources had an indirect effect on early retirement intention through work enjoyment (z = 6.71, p < 0.001). Based on the series of SEM analyses, it seems that the proposed JD-R model fit well to the data, even though we found some additional paths that were not predicted. Specifically, in addition to the hypothesised relationships, job demands predicted early retirement intention directly as well as indirectly through work enjoyment. Therefore, a third alternative model was tested that included both additional paths (partial mediation, partial cross-link model - M4). Compared to M1, adding both paths resulted in a significant improvement of the model fit, Δχ2(2) = 48.02, p < 0.001. All paths were significant (p < 0.001), except for the path from recovery need to early retirement intention. M4 was then trimmed by removing the non-significant path between recovery need and early retirement intention, which did not alter the model fit, Δχ2(1) = 3.73, ns. The final model (M5), which explained 19% of the variance in early retirement intention, is displayed graphically in Figure 2. Finally, to examine whether the observed relationships are invariant across sub-samples of 'older' workers, we conducted a multiple-group analysis estimating the same model as in Figure 2, for workers younger than 50 years and workers of 50 and older. This threshold was chosen as in Belgium the age of 50 is the earliest possible retirement age (Jousten, Lefèbvre, Perelman, & Pestieau, 2008). The analysis showed no significant differences between the two age groups, suggesting that workers older than 45 constitute a homogeneous group. The aim of this study was to investigate employees' intentions to retire early in the light of job-related factors derived from the JD-R model (Bakker & Demerouti, 2007; Demerouti et al., 2001). That is to say, we used early retirement intentions as the ultimate outcome of the health-impairment process and the motivational process that are central to the JD-R model. The motivational process is conditional upon a relationship between job resources and indicators of motivation, typically work engagement; a relationship that was replicated also in this study for work enjoyment. Taking this one step further, motivation is then assumed to relate negatively to withdrawal behavior; for example, turnover intentions in the study by Schaufeli and Bakker (2004), or absence frequency in the study by Bakker, Demerouti, De Boer et al. (2003). We showed that withdrawal may also refer to early retirement intentions. This hints at mediation, so that work enjoyment carries the relationship between job resources and early retirement intentions, which was demonstrated in this study (Hypothesis 2). The health impairment process assumes a relationship between job demands and strain. Examples of strain indicators are burnout or job dissatisfaction, or, in this study, recovery need. Strain, in turn, associates positively with withdrawal. Evidence comes from the studies by Geurts, Schaufeli and de Jonge (1998) and De Croon et al. (2004). However, we did not find such a relationship between strain and early retirement intentions, implying that recovery need did not mediate the relationship between job demands and early retirement intention. One explanation could be that recovery need is only a first stage to health impairment with few long-term effects. Instead, recovery need may concern short-term effects of a working day (Sluiter, De Croon, Meijman, & Frings-Dresen, 2003) that do not translate into long-term effects. Hence, a high need for recovery might not be alarming enough for older workers to set in motion the exit process. In this respect, other age-related physical and cognitive changes, including vision and hearing loss, increase in blood pressure, musculoskeletal problems and memory decline, might pose a more serious threat to employees' functioning, and therefore, might be more strongly associated with early retirement (Lund & Borg, 1999). In addition, we also established a cross-link from job demands to work enjoyment, so that job demands related negatively to work enjoyment, and a direct positive link from job demands to early retirement intention. An important route for future research is to further investigate these relationships, particularly from a theoretical point of view. Perhaps job demands are perceived differently according to age, so that job demands have a stronger negative effect on work affect and attitudes or intentions amongst older workers. For instance, young workers may see the same combination of high resources and high job demands as more challenging and hence more positive, as compared to older workers.  an indirect path from job demands work enjoyment early retirement intention. Secondly, by using the JD-R model we have extended the work-related perspective on early retirement. Work-related antecedents of early retirement have received some research attention, but many of these studies have been conducted without strong theoretical foundation, limiting understanding of the processes that explain early retirement decisions. Thirdly, it is important to note that for early retirement intention the associations within the model are different than was anticipated. The current results indicate that - for early retirement intention - the motivational process is more prominent than the health impairment process. In addition, when examining the antecedents of early retirement intention the emphasis is on the direct positive effects of the motivational processes and not on the buffering role of job resources on the relationship between demands and negative outcomes. This has important implications for organisations striving to keep their older employees. They should facilitate the motivational processes that are so important to lower early retirement. For instance, by re-examining job contents of older workers and redesigning their jobs with an emphasis on adding job resources instead of the traditional approach of decreasing job demands. The cross-sectional design was perhaps the most important limitation in this study; the implication is that we cannot draw causal inferences. Note, however, that our predictions are in line with theoretical arguments and that causal relationships from job demands to strain, from job resources to motivation and from strain and motivation to withdrawal have been demonstrated in previous studies (e.g. De Jonge et al., 2001). Perhaps a more serious concern is that we could not account for possible reciprocal relationships, for example, from work enjoyment to job resources or from recovery need to job demands. Such reciprocal relationships fit the notion of gain and loss spirals that have been demonstrated in studies in the realm of the JD-R model (see e.g. Demerouti, Bakker, & Bulters, 2004). Such spirals would suggest that the process described in this study reinforces itself. Thus, future research on early retirement decision making may profit from using longitudinal designs that account for possible cycles. A second limitation could be that our data was based on self-reports, which may present some risks associated with common method variance. In this respect, we followed many of the recommendations for questionnaire design proposed by Podsakoff, MacKenzie, Lee and Podsakoff (2003). We furthermore showed through confirmatory factory analysis that the items loaded on their respective factors, as intended. In addition, a 5-factor model in which each item loaded on its respective factor showed a better fit to the data than a single factor model, Δχ2(10) = 6133.67, p < 0.001. Another limitation is that our sample was fairly heterogeneous. This posed some challenges regarding the selection of specific job demands and resources. Indeed, every job comes with specific demands and resources, and this specificity was not accounted for in this study. We selected the job demands and resources that may have particular resonance for the group of older workers rather than for a specific job category to overcome this limitation. Furthermore, having a heterogeneous and representative sample presents some obvious advantages, amongst them the idea that results can be generalised to the broader population. Finally, we recruited workers from Belgium; a country where early retirement is relatively common. According to Eurostat, in 2001, Belgium was in the leading group of European countries with respect to early retirement. This is partly due to the generosity of the social security and pension systems in place in Belgium (Jousten et al., 2008). This particular setting may have influenced the results. Hence, future studies could explore the generalisability of our results to other cultures and countries. This study has important practical implications because it indicates that creating and sustaining a healthy workforce by no means guarantees that older employees will continue working until their official retirement age. Good health may be a necessary condition for retaining older workers, but it certainly does not appear to be a sufficient one. Just as their younger colleagues, older employees want to enjoy their work, and their level of enjoyment seems to play a major role in shaping their early retirement intentions. Hence, to retain older workers, companies should promote work conditions and practices that keep older workers happy and motivated. The practices could involve job re-design interventions by implementing extended job control and discretion over how older workers schedule and perform their job tasks, or assistance of older workers in maintaining and extending social networks. The latter may be particularly important as older employees often lack opportunities to form special, intimate peer relationships at work that provide high psychosocial support (Maurer, 2007). In this regard, mentoring may be especially valuable for inclusion of older workers. It offers a new challenge to older workers and protects them from becoming isolated. In this study, job demands and job resources were both associated with work enjoyment, which, in turn, was associated with older workers' intention to retire early. In addition, a direct link was established between job demands and early retirement intention. Recovery need did not add to the prediction of early retirement intention. These results suggest that, in order to retain older employees, it is not just sufficient to create a healthy workforce. Rather, organisations should continuously strive for measures that increase older workers' happiness and work pleasure. 1. The results of these analyses can be obtained from the first author upon request.